The Respiratory Therapy Department at D.W. McMillan Hospital provides a broad range of services in respiratory therapy to patients of all ages. They perform a variety of tests which assist in the diagnosis of heart and lung ailments and diseases. They provide breathing treatments and deliver supplemental oxygen which aid in the reduction, management and prevention of breathing related conditions. 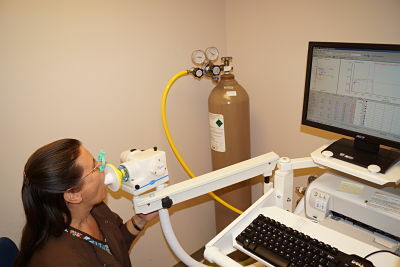 Respiratory therapy operates 7 days a week, 24 hours a day. Respiratory Therapist work under the supervision of a physician and work in the emergency room, ICU, medical and surgical areas and in the outpatient setting. They help establish and maintain the airway in respiratory failure and trauma patients. They often initiate and manage life support for people in ICU and the emergency room. A physician will need to write a prescription for a person to have any kind of respiratory therapy testing or treatment done. An ABG is a blood test that is performed using blood from an artery. It is a test that measures the pH (acidity/alkalinity), arterial oxygen tension (PaO2), carbon dioxide (PaCO2) and arterial oxyhemoglobin (SaO2). This information is vital when caring for patients with a critical illness or respiratory disease such as COPD or respiratory failure. This test requires an order from the physician but does not need to be scheduled. Co-Oximetry may be done along with an Arterial Blood Gas (ABG) to help determine the cause of hypoxia or oxygen deficiency at the tissue level. It helps distinguish between carboxyhemoglobin, methemoglobin, oxyhemoglobin and reduced hemoglobin. People who have been exposed to smoke in a house fire or from cigarette smoking can have an increased carboxyhemoglobin which can interfere with the amount of oxygen the patient can have in their blood. This test requires an order from the physician but does not need to be scheduled. 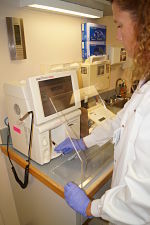 A PFT is a diagnostic test that helps the physician identify the severity of lung disease. It can also help determine if the lung disease is reversible by using a medication called a bronchodilator. It measures the ability of the lungs to move large volumes of air quickly in and out of the lungs. All PFT's done are interpreted by a pulmonologist (lung specialist). This test requires an order from the physician and needs to be scheduled prior to be done. This test can be scheduled by calling 251-809-8143. The sleep center at D.W. McMillan Hospital physicians in diagnosing and treating patients with complaints related to sleep. The center is accredited by the American Academy of Sleep Medicine. The rooms are comfortably furnished in a home-like environment. Testing involves painless, non-invasive electrodes attached to the scalp and skin. These monitor the sleep stages, heart rate, respiration, leg and eye movement and blood oxygen levels. Sleep studies require an order from the physician and can be scheduled by calling 877-232-2717 or select the following link to learn more: Sleep Center.